Virginia was on the verge of heartbreak Saturday. 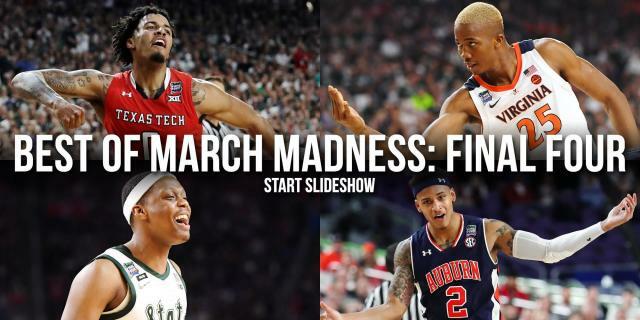 But junior guard Kyle Guy ensured that it was Auburn that would experience the agony of a Final Four loss despite some very bad mojo from Tigers guard Bryce Brown. Seeking their first national championship, the Cavaliers looked well on their way to Monday’s title game after extending a back-and-forth game to take a 57-47 lead late in the second half during Saturday’s Final Four matchup with Auburn. But Auburn, the giant killer form the SEC that had just run through Kansas, North Carolina and Kentucky to get to the Final Four, wasn’t done yet. The Tigers clamped down on the Cavaliers in the game’s final minutes, going on a 14-0 run over a 5:07 stretch to take a 61-57 lead with 17 seconds remaining. But Guy had all the answers the Cavaliers needed in the game’s final seconds. With nine seconds remaining, he hit a catch-and-shoot 3-pointer from the corner to cut Auburn’s lead to 61-60. It was a preamble to the drama to come. After being fouled, Jared Harper hit one free throw on the other end to give Auburn a 62-60 lead with seven seconds remaining. It set the stage for the biggest moment of Guy’s career and some of the biggest free throws in college basketball history. After a late Auburn foul, Virginia had the ball on the sideline with 1.5 seconds remaining. Guy broke free from his defender to catch the ball and heave a do-or-die 3-pointer with time running out. The shot clanged off the rim, but officials blew the whistle, signaling Samir Doughty for a controversial, but correct shooting foul that would send Guy to the line with 0.6 seconds remaining with the chance to win the game. Guy, an 81.8 percent free throw shooter, calmly stepped to the line and made the first free throw. With no hesitation, he shot and sank the second to tie the game. 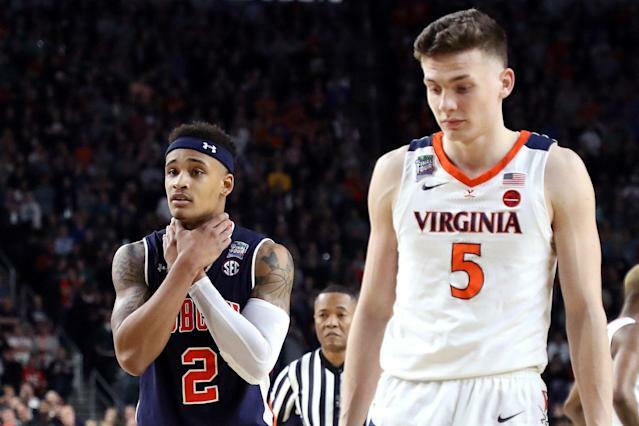 As he toed the line, Auburn guard Bryce Brown stood behind him delivering a less-than-subtle choke sign with both hands wrapped around his own neck. Whatever bad mojo Brown hoped to send was to no affect. After the Tigers attempted to ice Guy with a timeout after the second made free throw, he stepped up and sank the go-ahead free throw as cleanly as the first two for the 63-62 margin that proved to be the final score. Guy had just rescued the Cavaliers from the verge of defeat to advance his team to within one win of a national championship. With Virginia needing its junior guard to deliver on each of his four shots in the game’s final nine seconds, he did just that. Was he nervous standing on the free throw line? “Obviously there was a tingly feeling in my stomach,” Guy told reporters after the game. “It was a good kind of nervousness. I was trying to look for [my fiancée] Alexa, and I couldn’t see her because she’s too short, so I saw my dad. That recollection came after some time to digest the moment and celebrate. His raw reaction in the immediate aftermath of the game engulfed by a chorus of boos from an Auburn fanbase angry at the officials painted a rawer picture of his feelings. If he was terrified, he didn’t show it. Guy’s clutch shots immediately ensure his prime spot in the lore of Virginia athletics. If Virginia goes on to win the title on Monday, he will secure his status as an NCAA tournament icon.